Cozy. Refreshing. Charming. Come enjoy our Home away from Home. Our vacation rental is a perfect choice for a quaint and cozy stay away from home. With 1558 square feet, 3 bedrooms and 2 bathrooms, there is plenty of space for guests while still maintaining that cozy feel. Step inside our cottage and sit down for a minute on our bench in the entry way. Kick your shoes off and hang your coat up on a hook. Finding you've worked up quite the appetite, step around the corner into our fully functioning kitchen should you choose to cook. With stainless steel appliances, utensils, and counter space, you'll get that meal prepared in no time. Enjoy your fare in several places - sit down for a more formal dinner in our dining room, or meander outside onto our covered patio for a homey barbecue. You may just want to put your feet up while watching the game on our updated media system in the living room or master bedroom. Whether you stay with us for a day, a week, or a month, our master walk in closet provides storage solutions for all your needs. As you acquire loads of laundry during your stay, our laundry room is located right off the kitchen to help keep those linens fresh! When you need to refresh yourself in the restroom, you'll notice the high arches entering the hallway. The main bathroom itself feels spacious with its high ceilings and charming sink. Have extra guests? No problem with our second guest bedroom decorated in a modern southwest flare. Need some work space to complete a project while away from your office? Our den will provide the solace you need and is already furnished with a desk to help your project along. In the evening when you're ready to turn in, look no further than our spacious master suite. Curl up in the oversized chair with a good book, or get a good night's rest in our king size bed. Wake up to a warm bath in our spa like bathtub or take a quick shower to get to your meeting on time. When you want to soak up some Arizona sunshine out in the yard, you'll notice our cottage is fully landscaped in the front and back. Flagstone walkways, various trees, wooded privacy fencing, and meticulous upkeep provided are just some of the features you'll enjoy. Other features throughout our cottage include: upgraded appliances and fixtures; upgraded floors, fresh paint on cabinets, walls, and ceilings. Our decor was selected to provide the most warm and charming experience possible. We also pride ourselves on our white glove cleaning standards to ensure our guests the optimum experience. The Cottage at Sheridan: The perfect getaway, truly your home away from home. Our cottage located just 10 minutes from the heart of Prescott Valley. Views of Mingus Mountain peppered all throughout the neighborhood. It was a wonderful experience the house was clean and very comfortable. We strive to make the cottage clean and comfortable for our guests and take great pride in our 5 star rating. Very clean, comfortable house with all the amenities we needed. 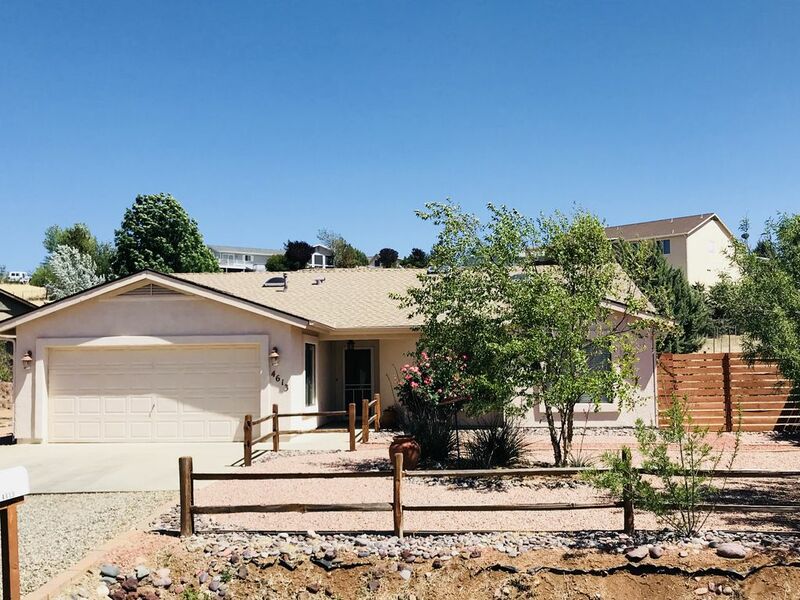 This home located in a quaint neighborhood in Prescott Valley was a great location. The bedrooms are very comfortable and the place is well kept and clean. The yard was comfortable and we wished we had more time to really use it. We would love to be back on our next visit. The Sheridan Cottage is a perfect place to play tourist in the Prescott (Pres-kit) area. The house was clean, well equipped and in a pleasantly quite neighborhood. The boxers enjoyed the fenced back yard and we enjoyed the sitting area out back. We visited Whiskey Row, Jerome, Tuzigoot, Out of Africa Tiger show, Fort Verde, Montezuma Castle and well, the local lakes. You can’t miss Mortimer’s farm as they have the best pies. Had great food at Left T’s, and The Palace and La Casita in Verde Valley. It was a great stay and we hope to return to the Cottage and this beautiful area soon. Nothing pleases us more than to know our guests enjoy the cottage and it’s comfort and amenities. It is an excellent central locale for the surrounding attractions! As always the house was perfect. We have stayed here at christmas. This time we rented the house so I could visit my Dad. Once again perfect. We are going to rent it again in October. We were in Prescott Valley visiting with family and rather than hotel rooms we opted for a VRBO home. This house is a jewel! Clean, comfortable, and convenient, the home is nicely appointed making the stay very pleasant. The home is managed by Molly who has the house set to welcome you with a basket of treats and soothing music. The grapes were hanging from the grape arbor and the humming birds were whizzing about the shaded back patio. We had absolutely no complaints. We will be back to Prescott Valley in the future and hope to stay in this home on those visits. You cannot go wrong selecting this home for your vacation stay in Prescott Valley. Beautiful house in beautiful neighborhood! What a lovely house- roomy and well equipped! We really enjoyed the fenced in yard and the little covered patio, where we enjoyed sitting out in the evenings. Nice location and quiet neighborhood. Everything you need in the house and it is spacious and kitchen has loads of space. The only suggestion we would make is to take out that fold down couch in office room and put in a regular double bed- make it 3 bedrooms. This fold down- even with a waffle pad we had brought, was not that comfortable. Otherwise- all is great here! Garage not accessible at this time. Pets are limited to dogs and the maximum is two. We ask that absolutely no smoking be done inside but also that if one chooses to smoke outside, that it is done away from open doors or windows.